The fragrant white flowers of the Easter lily (Lilium longiflorum giganteum) are a traditional symbol of the season. In its native southern Japan and Ryukyu Islands, the plant blooms in July but in cultivation, it is forced into earlier flowering for the Easter trade. Also known as the Bermuda lily (L.l. eximium), it was a supplier of bulbs in the late 19th and early 20th century. Japan then dominated as the world’s largest grower until WWII. Attempts to regain its market share after the war failed due to the emergence of the growers here on the California-Oregon border, who now produce 95% of the bulbs for the U.S. and Canadian market. U.S. production began with Louis Houghton, who introduced hybrid lilies to the south coast of Oregon in 1919, where conditions for cultivation are ideal. When the Japanese source of bulbs was interrupted during the war, lily bulbs increased in value and a new industry was born. When choosing a lily, look for a high-quality plant that has a couple of open or partly-opened flowers and several unopened buds.. Foliage should be dense, dark green and extend to the soil line, indicating a healthy root system. Inspect the flowers, foliage and buds for any signs of insects or disease. Unless they were just delivered, avoid Easter lilies displayed in paper, plastic or mesh shipping sleeves; plant quality will deteriorate if these sleeves are left on too long. Soil should be moist, but not wet; a wilted, waterlogged plant may be suffering from root rot. 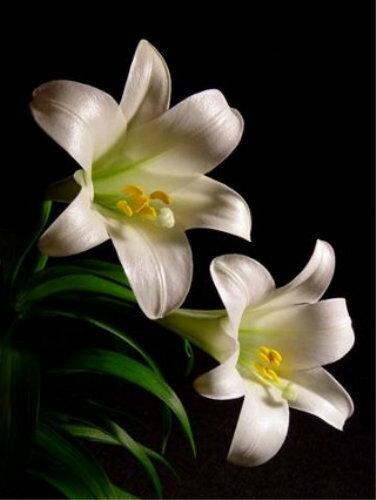 At home, position your Easter lily near a window that gets bright, indirect daylight, away from direct sunlight; a daytime temperature of 60 to 65° F is ideal. Avoid exposure to excess heat or dry air from appliances, fireplaces or heating ducts. Keep the potting medium moist, watering lightly only when the soil becomes dry. If the pot is wrapped in decorative foil, don’t allow the plant sit in trapped, standing water. As the flowers open and develop, remove the yellow anthers with small scissors before the pollen starts to shed. This increases the life of the flower and prevents the pollen from staining the flowers or tablecloths. When a mature flower starts to fade and wither, cut it off to keep the plant looking attractive. If you see your cat eating the Easter lily plant, call a veterinarian immediately. The kidneys are affected, with symptoms including increased urination, depression, stomach upset and dehydration. The sooner emergency treatment is initiated, the better the chances that the cat will recover. If more than 18 hours elapses after consumption, the cat may not survive, even with emergency care. Easter lilies can be planted outside after the blooms have faded and the danger of frost has passed. Remove old flowers, leaving the stem and leaves. Select a sunny spot with well-drained soil and dig a hole deep enough so the top of the bulb will be six-inches below the soil surface. Amend the soil in the planting hole with some organic matter and lime. Good drainage is critical to success with lilies. Lilies prefer a cool soil environment, so mulching with a 2-inch layer of compost, pine straw, or shredded leaves helps conserve moisture in between waterings, suppresses weed growth, keeps the soil cool and provides nutrients as it decays. With proper protection, Easter lilies that were forced into flower in March or April under controlled greenhouse conditions will flower naturally in June or July the following and subsequent years, reaching a height of about 3 feet.